Heard a provocative radio interview yesterday, on a BBC report broadcast in San Francisco. Unfortunately, couldn't find the audio online. But articles linked here give the gist. 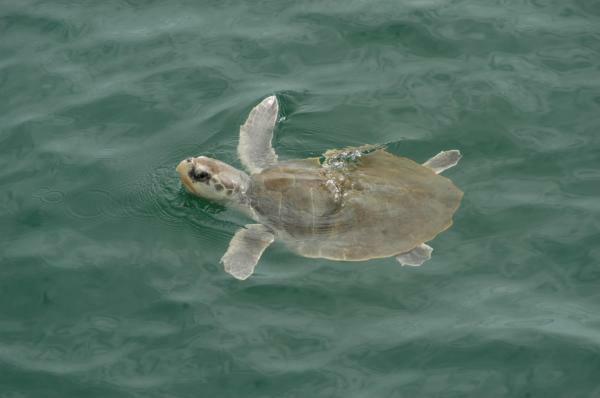 ► Odds are that Kemp's Ridley Turtle, the species of the hatchling swimming above right (credit), will be the 1st to go, Power says. ► Not far behind is the bluefin tuna (below right) (credit) -- which, just this past March, failed to win protected status in negotiations under the rubric of CITES, the Convention on International Trade in Endangered Species. 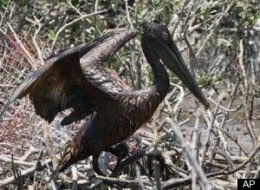 ► Louisiana's state bird, the brown pelican, lags in this macabre race, though yesterday's photo of an oil-blackened member of that "brown" species (left) (credit) may alter its odds. This latest betting option seems to have turned a few stomachs. Power's response? 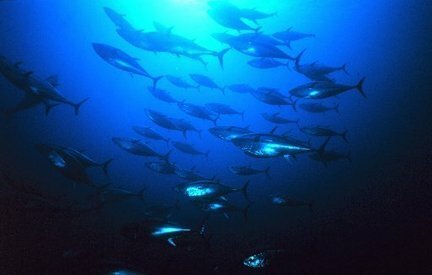 [T]he Irish bookmaker said it hoped the betting would 'highlight the environmental catastrophe' and the 'sure bet' that it would lead to the loss of some marine species. The stated goal's a good one -- stirring environmental awareness among the punters, and, as Power said in the radio interview, reminding the human species of the costs of its "greed" for oil. Power did stop well short of promising to contribute profits to animal welfare. Still, anger would be better placed at the industry (and regulators) responsible for the tragedy and the so-far-ineffective response to same.